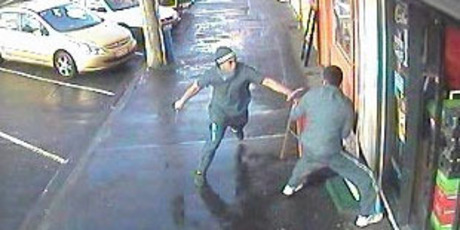 Dramatic footage of a liquor store worker with a hockey stick chasing off a knife-wielding robber has been released by police. The CCTV images give a glimpse of the tense confrontation that unfolded after two men demanded cash and took alcohol from the Thirsty Liquor bottle store in Upper Hutt last Tuesday. One shows a man gesturing aggressively with a knife as he stands before the counter. Another shows the same man in a standoff with a worker outside the shop. Detective Sergeant Chris Gooch of Hutt Valley police said the men entered the store on Fergusson Drive in Silverstream about 5.45pm. One demanded money from a worker at knifepoint and the second took some bottles of alcohol from a shelf. The staff member struck one of the offenders with a hockey stick before chasing them both out of the shop. Mr Gooch said the offenders ran across the railway tracks to a vehicle waiting in a car park opposite Silverstream Primary School. The maroon four-door Nissan hatch or similar, with a number plate starting with the letter T, was last seen driving north along Gard St.
Police have released the CCTV images in the hope they will help to identify the offenders. "We would like to hear from anyone who may have been in the vicinity of Thirsty Liquor at the time of the aggravated robbery last Tuesday night or from anyone who has any other relevant which may assist police,'' Mr Gooch said. Staff at the store were reluctant to talk about the incident today, saying the matter was being dealt with by police and they did not want to comment in the media. Anyone with any information should contact Hutt Valley Police on (04) 560 2600 or phone Crimestoppers on 0800 555 111.